As a corrective exercise specialist, I rarely used the term functional training because it meant little to most. My clients had specific pains that prevented them from doing what they had to do or what they wanted to do. Most of these pains had nothing to do with physical motions. They were the result of a sequence of behavior patterns. Clients wanted the pain to go away and wanted to know if I could help. I needed to know if they really wanted the pain to go away and not return. Functionality, in their mind, had very little to do with the pain because most of them had found alternatives ways to get the job done. From their point of view, they were functional. I remember hiring a male fitness model for one of my video shoots. He had assumed that the shoot was still images. He was handsome and ripped. The shoot was not still images; it was about exercise form. How handsome or how ripped he was made no difference to the ability in following the form accurately. I am very particular about exercise form because I understand the delicate nature of joints and ligaments despite their power. Exercise form is part of functional training that improves strength without damaging the body. As I stepped behind the camera, I asked him to perform a lat pull down. As soon as he raised his hand, I asked him to stop. He had all the telltale signs of the shoulder injury. He would swing his hand slightly to get his arm going and then shrug by bringing his shoulder towards his ear to lift his arm up. In a lat pulldown, you need to keep your shoulders stable and away from your ears. Those of you with a shoulder injury know exactly what I am talking about. Your don’t raise your arm up, you lift your shoulder up and your arm barely reaches your shoulder height. And this is exactly what my fitness model wanted to do if I had not stopped him. If the shoot was still photography, more than likely he would have been fine. Still pictures are snapshots of a position. They do not show the path you took to go from one image to the next. Form is about the path you take and cannot effectively be demonstrated in still images. Functional movement exercises are about performing well at your job and your hobbies by naturally following the anatomical and physiological pathways of your body. These pathways, especially the anatomical pathways are not debatable, subject to opinions or your will power. You need to understand them and work with them to retain your ability to use your motion effectively over a lifetime without pain. Your performance in most exercise programs and your ability to win in most sports activities have very little to do with these established and reliable natural pathways. A dancer standing on top of her toes looks beautiful. A martial artist breaking bricks with his elbow has tremendous power. A yoga student may demonstrate a shoulder stance that flexes her neck to a 90-degree angle. A soccer player may kick the soccer ball with the side of his foot and score a goal. Every one of these actions is a functional action in relation to the athlete’s performance and her goal of winning. However, every one of them goes against the bodies design and it is harmful to the body. As the athlete ages, he or she begins to experience pain and considers it normal, and many physicians call it age-related progressive degeneration that could only get worse and could only be managed. When your mindset or your physicians mindset accept an experience as “progressive degeneration”, is there any hope for treating it, curing it or reversing it? These are behavior patterns. They are subject to you and your choices. In the examples of the dancer, the martial artist, the yoga student and the soccer player, the feet are not built to stand on top of the toes, elbows are not designed to break bricks, the neck should not be bend to 90-degree flexion and your knee do not bend sideways. By the way, I have done these all motions as I experimented with various forms of movement. Since most of my activities are not done in front of an audience, there aren’t that many images I can show you. 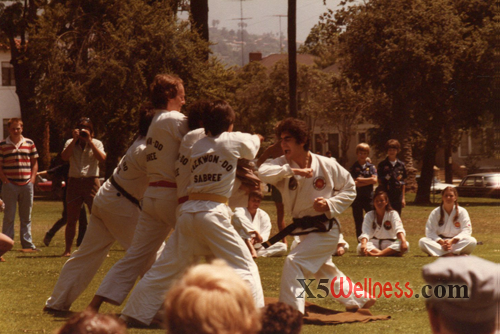 In this case, the picture you see above is an elbow strike taken years ago during a demonstration in Santa Barbara under the careful supervision of now Grand Master Sabree Salleh. I have great respect and love for him. 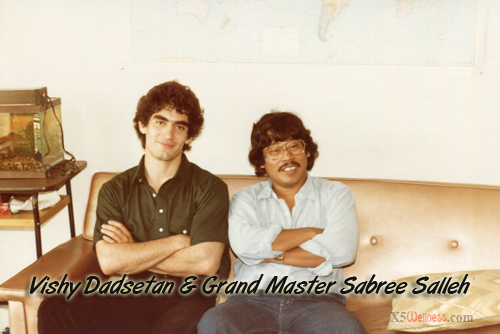 I think many of my potential injuries were prevented because of the way he taught me. The image below is one of my favorites with him. We were both much younger then. The activities I mentioned are functional in the way they serve the athlete. They are not functional in the way they serve life and learning them do not do help you perform actions you need to take through your life. Not everyone is an athlete, many have jobs that seem to be far removed from athletic performance. A mother, an accountant, a lawyer, a plumber, a computer programmer, a landscape laborer, a doctor and hundreds of other professions are examples. Do the anatomical and physiological pathways change because you have a degree or a job title? In each of these roles you play, your behavior patterns could lead to improved fitness or experiencing pain. Denying, ignoring, and masking the pain are all parts of the behavior pattern that damages the body to the point that you can no longer tolerate it. In some cases, denial, ignoring the problem or masking it limits your motions and abilities that it no longer matters. Then other health concerns kick into high gear. To me, one of the worst possible denials is denying your strength and ability to change while suffering from your actions. I lose whatever limited sense of humor I have when someone smiles and tells me; they are unable to do something that is completely within their ability to perform. It truly hurts deep inside as I watch many who are very close to me and those who I meet as clients who often become friends deny their own strengths and suffer because of it. However, I value their freedom of choice more than the pain I feel watching how they harm themselves. I can only assist when they ask and when they demonstrate a willingness to use their strength. Life is a divine expression of free will. It is designed to help us understand and benefit from Divine Laws. Passive participation makes the journey a little longer. Functional training focuses on a process that assist you in living a healthy, pain-free life. It must address all the elements of your behavior pattern that cause sickness and pain. It includes expansion of awareness of your goals, your strengths, your weaknesses as well as the threats in your path and opportunities you have. SWOT analysis is an effective structure to use. You may want to look it up. Spiritual beliefs, mental framework, emotional needs, nutrition, and exercise are all part of the functional training. In the video below I introduce you to two examples of full body functional exercises. One is to help you with impressive performance in sports, and the other is necessary for almost every activity you do that requires knee, glutes, and low back engagement. Many may like to do the first and they can with training but everyone regardless of age needs to know how to do the second one. The first one has many sports applications, but the second one has a day to day use especially for those who suffer from knee and low back pain.